The Fifty Best held a “blind” tasting with 17 members of the spirits judging panel and 28 flavored vodkas in three separate categories: Fruits, Coffee, and Herbs, Spice & Miscellaneous. The judges were informed of the categories and flavors, but not the brands. Strict tasting rules were applied. The order of service was established beforehand by lottery. Each of the flavored vodkas were poured into fresh glasses from new sealed bottles, and served at slightly above room temperature. Only ice water and unsalted chips and crackers were available to cleanse the palate. 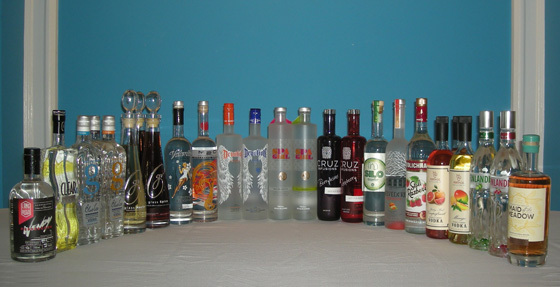 The Flavored Vodkas were tasted in groups, according to flavor category – with medals awarded on the basis of the judging panels’ rating of all flavored vodkas from that group. The judges wrote down their impressions of each product on score sheets. The scoring was done on a 5-point system, with 5 as the best. Double-Gold, Gold and Silver medals were awarded according to a set range of final point scores received from the judges. There were no Bronze medals awarded in this tasting. The tasting notes that follow are summaries of the judges’ opinions, with all replicated commentary eliminated. The states/countries of origin and other tidbits are identified for each brand. Aroma: Coconut, toasted coconut, vanilla, clean, attractive, well-balanced. Palate: Coconut, sweet coconut, cream of coconut, Almond Joy, buttery, vanilla, Malibu-like, silky smooth, instant classic. Finish: Coconut, pineapple, buttery, spicy, flavorful, not too sweet, clean, smooth, silky, elegant, good to blend. Aroma: Red grapefruit, grapefruit peel, citrus, strawberry, grassy, peppery. Palate: Red grapefruit, acidic grapefruit, lemon-lime, citrus, tart, intense, clean. Finish: Grapefruit, like an 80s Tropicana grapefruit, ginger root, slightly tart, very clean, pleasant. Aroma: Lemon-lime, citrus, key lime pie, lemon candy. Palate: Lime, citrus, lemon peel, lime peel, tangerine, citrus candy, limoncello, peppery, not too sweet, tart, good acidity, liquor-like, well-balanced. Finish: Sweet lime, tangerine, citrus, lemon peel, grainy sugar, round mouthfeel, well-balanced, likeable. Aroma: Mango, Mexican dried mango candy with chile, mango ice cream, fruit cocktail, sour mash of fruit, fruit forward, intense. Palate: Mango, lemon, tropical, sugar cane, honey, anise, licorice, cumin, medium sweetness, well-balanced, complex, attractive, natural flavor, really authentic flavor. Finish: Mango, deep cane sugar, nice texture, soft, smooth, mellow, elegant, great for cocktails. Aroma: Lemon, lime, citrus, 7-Up, bright, cool, clean. Palate: Lime, lime zest, limeade, lime oil, watermelon Gatorade, tree bark, spicy, mineral-like, approachable, refreshing, very good as a mixer. Finish: Lime, citrus, loganberry, pomegranate, herbal, tart, clean, natural, good balance, tasty, great. Aroma: Raspberry, berry, apple, grape, Schweppes raspberry seltzer, tart, bright, clean. Palate: Raspberry, berry, powerful bursts of clean fruit, tart apple, lemon, very lean, clean, not sweet, well balanced, soft, smooth. Finish: Forward berry, cherry, lemon peel, buttery, light spice, tart, clean, smooth, flavorful. Aroma: Sour peach candy, light fresh peach, orange, rosé wine, clean, bright, smooth, pale pink. Palate: Not quite ripe peach, Snapple peach ice tea, tangerine, candy, silky, creamy, perfectly balanced, smooth, mellow. Finish: Peach, peach ice cream, vanilla bean, soft, silky, smooth. Aroma: Pear, peach, apple, unripe Granny Smith. Palate: , green apple, lightly infused white peach, citrus, lemon, melon, grassy, 7-up, very light, smooth, bright. Finish: Pear, clean, subtle, soft, light, delicate, very clean. Aroma: Orange, citrus, orange peel, raspberry, Fruit Loops, natural. Palate: Freshly cut orange, blood orange, tangerine, grapefruit, citrus, orange peel, orange hard candy, orange seltzer, raspberry, smoky, full flavors, well-balanced. Finish: Orange, lemon, citrus, spicy, smoky, very fresh. Aroma: Peach, nectarine, citrus, floral, ice tea, cigar tobacco, bright. Palate: Peach, canned peaches, grape, buttery, maple, sage, tea, wood, oaky, tart. Finish: Peach, lemon-lime, sweet, clean, complex, attractive. Aroma: Strawberry, raspberry, blueberry, cherry, watermelon. Finish: Fruit, clove, dusty, earthy, soft, mellow, flavorful. Aroma: Raspberry, raspberry jam, strawberry, cherry blossom, cotton candy, bubblegum. Palate: Raspberry, wild raspberry, raspberry Jolly Rancher, wild berries, grapefruit, sweet cane, mint. Finish: Raspberry, lemon, bubblegum from baseball cards, slightly tart, perfume-like, silky, balanced, approachable, intense. Aroma: Peach, plum, apple, aromatic exotic fruit, fruit roll-up, burnt sugar, caramel, baking spices, intense. Palate: Peach, tangerine, orange, pomegranate, mango, red apple, mixed fruit, sharp oily peach rind, spicy. Finish: Peach, spicy, peppery, wood barrel, clean. Aroma: Raspberry, blueberry, plum, citrus, lemon, blue Curaçao, sweet candy, well-perfumed. Palate: Raspberry, blueberry, bubblegum, clean. Finish: Lemon, licorice, clean, crisp. Natural spring water, natural flavored infused. Aroma: Raspberry, blueberry, berry, grape, lime, tropical fruit, Havana punch, Capri-Sun, fruit bubblegum, floral, fresh air. Palate: Raspberry candy, berry, blueberry, tropical fruit, watermelon, orange, orange Kool-Ade, lemon, light grape drink, bubblegum, anise, licorice, easy. Finish: Blueberry, grape, saltwater taffy, soft, clean. Aroma: Lemon, lime, key lime, citrus, lemon-lime soda, pear, elderflower, floral, mint, wintergreen. Finish: Lime, pear, light floral, iced coffee, cream, clean, smooth. Aroma: Cranberry, berries, sour apple, floral, faint juniper, cream, wet stone, wet leaves, tart, Christmasy, like a bière de garde. Palate: Cranberry, raspberry, blueberry, berry, citrus, lime, orange peel, mint, spearmint, peppery, piney, tart, good balance of sweetness. Finish: Spearmint, mint, herbal, pine notes, flavorful, clean, good for Bloody Mary, I want this for cocktails. Aroma: Dark berries, bitter blueberry, light mint, very nice. Palate: Blueberry, sour apple, aperitif, dry. Finish: Blueberry, blackberry, berries, sour apple, berry hard candy, blueberry bubblegum, vanilla, licorice, anise, tart, smooth. Aroma: Like a great cup of coffee, unsweetened coffee, coffee beans, cacao, butterscotch, toffee, caramel, molten chocolate cake, lovely. Palate: Wonderful coffee, espresso, unsweetened coffee, ground coffee, creamy, caramel, orange, lemon, licorice. Finish: Toffee, buttery, coffee grounds, super dry, flavorful, smooth, bright. Flavor Category: HERBS, SPICE & MISC. Palate: Cucumber, dill, vegetal, pickles, mint, spearmint, thyme, cumin, woody, clean, fresh. Palate: Cucumber, sweet pickled cucumber, dill pickle, lemon, lemonade, melon, hint of mint, spearmint, not too sweet. Finish: Citrus, rose petals, floral, herbal, mint, clean, bright, gentle, refreshing. Palate: Aroma: Fresh peppercorn, pink peppercorn, green peppercorn, black peppercorn, peppery, spicy, mango, ginger, mint, basil, smoky, attractive, vibrant. Palate: Pink peppercorn, red peppercorn, black peppercorn, spicy, sauce au poivre, sweet basil, mint, wintergreen, wonderful mouthfeel, well-balanced, smooth. Finish: Peppery, spicy, mint, earthy, surprisingly sweet, soft, subtle, perfect for a Bloody Mary, enjoyable. Aroma: Magnolia, lilac, jasmine, fresh blossom, floral, honeysuckle, lemon, lime, citrus, peach, white vermouth. Palate: Elderflower, lilac, floral, honey, honeycomb, vanilla, peach, lychee, grapefruit, lemon, light citrus, vegetal, herbal, oaky, wood barrel, very well-balanced. Finish: Elderflower, rose, floral, bitter grapefruit, peppery, oak, wood, good balanced sweetness, delicious. Aroma: Cucumber, string beans, green vegetables, water chestnut, vegetal, herbal, earthy, mild wood. Palate: Cucumber, cucumber with skin on, green beans, vegetal, basil, refreshing floral, light mint, pure, clean, organic. Finish: Cucumber, vegetal, clove, honey, pleasant, smooth, refreshing, the essence of cucumber, classic. Aroma: Toffee, Fireball candy, gingerbread, cinnamon, nutmeg, clove, cassia, cardamom, allspice, light sage, spicy, soft pepper. Palate: Honey, apples, Fireball candy, cinnamon, nutmeg, clove, cassia, cardamom, allspice, saffron, peppery, Gammel Dansk, full flavor. Finish: Cinnamon, hot spice, gingerbread, soft eggnog, balanced, smooth. Aroma: Honey, herbal, lemon, citrus, pleasantly nutty, heavy oak. Palate: Dandelion, herbal, honey, Ricola candy, alpine, very Euro, black tea, blueberry, cherry, tobacco, leather, creamy, complex, not too sweet, nicely blended. Finish: Dried herbs, herbal, honey, butter, creamy, peppery, woody, soft, smooth, mellow, nice savory quality. Aroma: Vanilla, butterscotch, caramel, toffee, creamy, angel food cake, yellow cake, frosting, chocolate cake, chocolate batter, popcorn. Palate: Vanilla, vanilla pudding, butterscotch, caramel, creamy, chocolate, amaretto, angel food cake, birthday cake, cake batter, cookie. Finish: Vanilla, cake, nutty, light, soft, smooth. Aroma: Strong honey notes, honeycomb, faint subtle light caramel, cake filling, peach, soft orange, curry leaves. Palate: Toffee, caramel, honey, nectar, dried apricot, exotic passion fruit, floral, mountain flowers, deep herbal, woodsy. Finish: Honey, honeycomb, cinnamon, spicy, woody, clean.